Do you love our store? Then let your fellow CT residents know about us… Vote Cook and Craft to be “Best of the Gold Coast” in Home and Retail Services Category. another great product we found this year comes from Potting Shed Creations. this company “started out as the proverbial garage business” in 1998. as a small business owner, we have soft spots for these kinds of companies. their philosophy of offering products of the finest quality, even surpassing customer’s expectations, has garnered some recognitions from the media. but we like their products because they are truly special… the seeds are USDA certified organic, the pots are made from rice hulls and fully recyclable and everything is made in America. 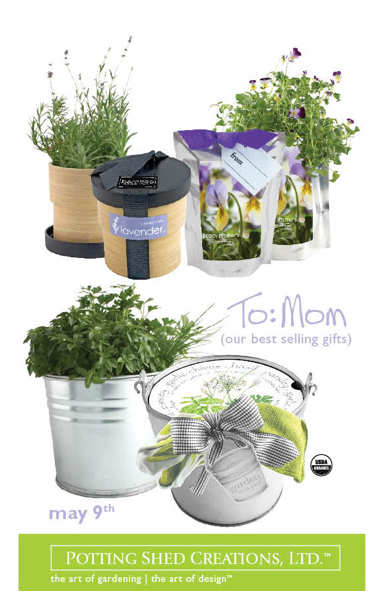 we carry the lavender, lemon basil, garlic chives, parsley, basil bouquet, sweet pepper, and tomato. each pots are fully equipped with potting material and seeds. all you have to do is add water. and we think Mother Earth would approve this gift!